the days of the 70mm roadshow presentations into one of the most unique motion pictures ever made. a possible complete soundtrack CD release. knowledge of movies to help solve the case. "Mad World" was referenced in TWO episodes! Brief clips shown for informational purposes only! Buy "Remington Steele" on FOX Home Video! EPISODE 24 - SPENCER TRACY BIOGRAPHY AND MORE! Author James Curtis on his critically aclaimed book and more! 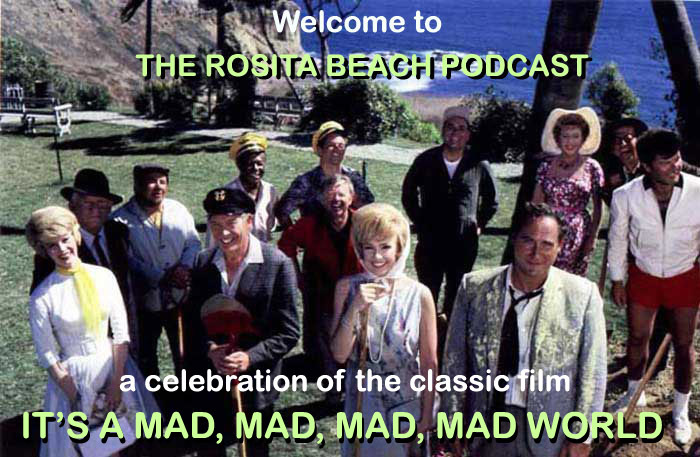 EPSODE 23 - THE ROSITA BEACH PODCAST RETURNS! VIDEO episode with a rare surprise! EPSODE 22 - EXIT MUSIC! The news you've waited a long time to hear! Plus, Greg Pane's new CD! A sincere THANK YOU to all who supported our efforts! EPISODE 21 - RING IN THE NEW YEAR! Another great music cue plus Edie Adams' son Josh at the family auction! (30:00) CELEBRATING OUR 20TH EPISODE! and more music, of course! EPISODE 18 - (40:00) "Arnold Stang remembers "Mad, Mad World"
A very special episode with rare audio. EPISODE 17 - (20:00) "California Dreaming"
the Cinerama Dome in 70mm and you are there! Plus yet another new CD with the MAD WORLD theme! EPISODE 16 - (15:00) "Away We Go to the Cinerama Dome"
News of a great new CD, another classic cue and more! EPISODE 15 - (10:00) "Stanley Kramer inteview for the 25th Anniversary (1988)"
A special VIDEO episode! Features rare footage of the 1963 Cinerama Dome press conference! EPISODE 14 - (12:00) "We wouldn't! We couldn't! We shouldn't!" EPISODE 12 - (20:00) The most requested cue of all plus more! Here are four TV spots created by the legendary Stan Freberg featuring the cast. Presented for informational purposes only, and we hope you enjoy! EPISODE 10 - (75:00) CELEBRATING OUR 10TH EPISODE! EPISODE 9 - (7:00) "Every Man For Himself!" We're gearing up for a very special 10th episode! EPISODE 8 - (23:00) "Good Old Smiler!" plus a few new cues! Thanks to Dave, Jim and Phil for this episode! a new music cue and more! the film version of "Gullible Otto Meyer"! "Mad World" Goes Bollywood! A new comedy from India titled "Dhamaal" (that means "Madness" in English) borrows very heavily from "Mad World". Watch our montage and see what we mean! EPISODE 4 - (7:00) A sample of the famous "Intermission Police Reports"! EPISODE 3 - (1:00) Quickie podcast with another rare radio spot! EPISODE 2 - (5:00) A radio spot from the original release and more! EPISODE 1 - (5:00) A little rough around the edges, but we get up and running!